Justin’s note: I just read Nick Giambruno’s most recent issue of The Casey Report, and today, I want to share an important section from it—one that shows exactly why oil stocks are on the verge of a massive rally. Big Middle East wars are often catastrophic for global oil supplies. This makes sense. The Middle East accounts for more than 40% of global oil exports. So, a big conflict in the Middle East often triggers a big spike in the price of oil. Take the 1973 “oil shock,” for example. Oil prices suddenly spiked… roughly quadrupling in a matter of weeks. Today, we could be on the verge of an oil crisis even worse than that. That’s because regional tensions are growing in the Middle East. Specifically, the conflict between Iran and Israel—and their allies—is quickly getting worse. As I’ll explain in a moment, this conflict could soon explode, causing a sudden spike in the price of oil. But first, let’s take a quick look at the first two oil shocks to see how this could all play out. These days all you hear is “Bitcoin this, Bitcoin that.” But there’s a far more reliable way to consistently generate cash from the market at lightning speed. What’s the catch? It’s a simple, yet overlooked hedge fund money “secret” that’s worked for me every day for the last 15 years. 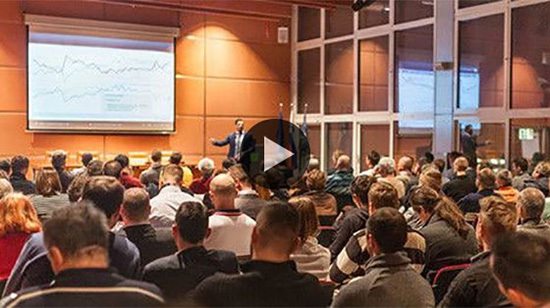 Click here now to see me reveal the shocking details in this short 3 min video. Hurry! I’m taking it offline permanently Sunday at midnight. Click here to see everything. In 1973, Israel was battling Egypt and Syria in the Yom Kippur War. In response to US support for Israel, the Organization of the Petroleum Exporting Countries (OPEC) placed an embargo on oil exports to the US and several other countries. It also cut oil production. This triggered the first oil shock. The price of oil nearly quadrupled. It jumped from around $3 per barrel to around $12. 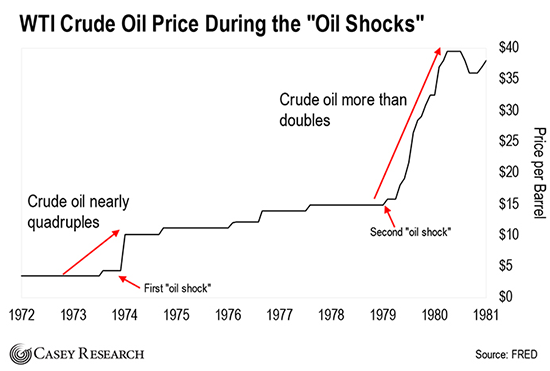 The second oil shock started in 1979. It grew out of the Iranian Revolution and continued with the Iran-Iraq War, which was one of the bloodiest conflicts of the past 50 years. Iraq and Iran were (and still are) two of the biggest oil exporters in the world. So, it’s no surprise that the war rocked global energy markets. The price of oil more than doubled, as you can see in the next chart. There was also another, less dramatic price spike in the early 1990s. 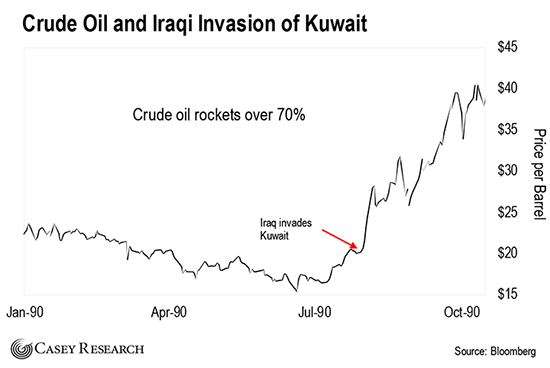 It happened after Iraq invaded Kuwait, triggering the first Gulf War. Oil shot up over 70%, as you’ll see in the next chart. 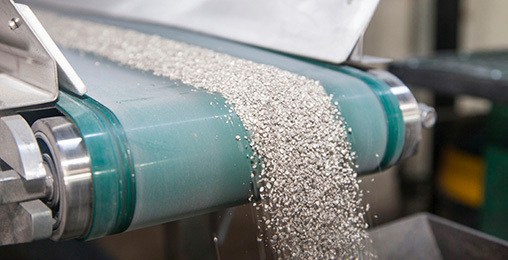 Rare Refined Powder Can Return 10x More Profits Than Bitcoin? It’s a rare commodity that’s no longer produced in the U.S… but it’s 100% essential to nearly every item used by our military today. To learn how to access the name of this company and its ticker, click here. The Middle East is divided into two basic geopolitical camps. On one side, you have the US and its allies, like Israel and Saudi Arabia. On the other side, Russia and its allies, like Iran and Syria. You likely know that a bloody conflict has been raging in Syria for nearly seven years. It’s the most significant military conflict on the geopolitical chessboard today. The US-side, working through its proxies, has been trying to overthrow Syria’s leader, Bashar al-Assad. Meanwhile, Russia and Iran have massively fortified his regime. Assad is still firmly in charge. This has shifted the regional balance of power toward Iran. The US, Israel, and Saudi Arabia find that unacceptable. But at this point, a war is the only thing that could reverse the trend. Iran will almost certainly be the focal point of the Middle East’s next regional war. Many people think that war has already started. Recently, Israel launched its biggest military strike on Syria since the 1973 Yom Kippur War. This attack, and other recent ones, killed dozens of Syrian and Iranian soldiers. I only expect the conflict to escalate from here. Aside from what appears to be the start of an actual war, there have been numerous, unambiguous signs that the US has Iran in its sights. To start, Trump has recently staffed up on known war hawks. In April, he made John Bolton his National Security Advisor and Mike Pompeo his Secretary of State. Both have been eager to bomb Iran for years. In early May, Rudy Giuliani, one of Trump’s lawyers and a longtime political ally, announced that Trump is “committed to regime change” in Iran. A few days later, President Trump pulled out of the 2015 Iran nuclear deal. He also re-imposed economic sanctions on Iran. Iran has the world’s third-largest proven oil reserves, or 10% of the world’s total. It exports about 2.4 million barrels of oil per day. China, India, and Europe buy most of it. Iran could effectively shut down the Strait of Hormuz, the narrow channel connecting the Persian Gulf to global markets. It is the only sea route from the Persian Gulf to the open ocean. Tankers moving oil from Iraq, Iran, Saudi Arabia, Qatar, Kuwait, and the United Arab Emirates all have to pass through the strait. That translates into roughly 35% of the world’s oil traded by sea. Nearly $2 billion worth of oil passes through the Strait of Hormuz every day. It’s the most critical oil choke point in the world. In the event of an all-out war, Iran would quickly shut down the Strait of Hormuz. It’s been blatantly clear about this. Credible studies have shown that—in a best-case scenario for the US Navy—Iran could seal off the Strait with sea mines and asymmetrical warfare techniques for at least a month before the US could reopen it. The Pentagon itself has admitted as much. If and when a war with Iran happens—even if there’s only a whiff of it happening—investors should expect the third and most dramatic oil shock. Of course, we’re not cheering for a war, or the collateral damage that would inevitably come with it. Nevertheless, the odds of a big war in the Middle East starting soon are high. That means a sudden spike in the price of oil is equally likely. There’s a good chance of outsized returns and soaring dividends in select oil stocks in the weeks ahead. I recommend positioning yourself for big profits now… before the bullets really start flying. P.S. Last week, I told Casey Report subscribers about an elite company in the oil industry set to soar along with the price of oil. I think it’s poised for big gains… even if tensions in the Middle East cool down. Are you investing in oil stocks? Let us know how it’s going.